Research of the development of the low-toxic mixtures for degassing and refining of aluminum alloys on the basis of carbonates are presented. The developed available method to determine the dispersion of the materials is described. It is shown, that the developed disperse mixture of carbonates is not less as effective as traditional refining preparation, but has considerably less toxicity. Key words: alloys based on aluminum, carbonates, degassing, refining, toxicity, dispersion. The work studies the relationship of structure parameters with electric conductivity and the passage speed of ultrasound in the pattern alloy Al-6%Si. It was found that the alloy's conductivity and passage speed of ultrasound increase with the decrease in eutectic silicon size. Inoculation of the industrial alloy AK6M2 with small additions of fine-crystalline master alloy AlTi5 allows to reduce the holding time for hardening from 4 to 2 h without a decrease in HB hardness. Correlation between the pattern of hardness change and electric resistance of silumin was established. Key words: fine-crystalline master alloys, electric conductivity, electric resistance, ultrasound, hardening, HB hardness. The behavior of metal in the effective range of crystallization was simulated with use of finiteelement software ANSYS APDL. The stress-strain state of two-phase microstructure near soli-dus was calculated. It was shown that coupled analysis both of shrinkage defects and mechanical stresses in castings allows more precisely to predict the formation of cracks. The evolution of cracks depends not only on the temperature fields and the associated thermal stresses and strains, but also it depends on the localization of shrinkage porosity. Key words: computer simulation, ANSYS, cast alloy, effective range of crystallization, stress-strain state. It is shown the computer simulation in FLOW-3D of composite preparation and spun casting. Key words: aluminum, composite, computer simulation, gradient material, silicon carbide, spun casting. Process of kinetics of crushing anthropogenic foundry waste (refractory clays, molding and core sands, sand, slags, etc.) to the nano-size fraction has been studied. General regularities of the process have been revealed, recommendation made. Key words: anthropogenic waste, refractory clays, molding and core sands, sand, slags, crushing kinetics, nano-size fraction. The paper deals with the method of steel casts surface alloying by ferroboron for formation of finish, featuring increased hardness and durability; the paper presents the result of metallographic studies of alloyed surface. Key words: surface alloying, ferroboron, lost foam casting. 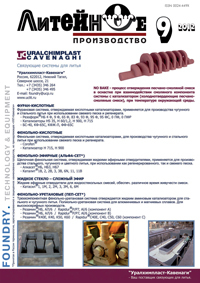 The article sets forth the experience of mastering the low-pressure die casting to produce sound castings from aluminum alloys at the Mechanized Foundry "Vikom", Kamensk-Uralsky, on a model AL14-10SR machine made by the German firm KURTS. Key words: low-pressure die casting, chill mold, sound casting, aluminum alloy. Analysis of methods of making ceramic shell molds in investment casting, determination of promising directionsand technologies of forming their structures to ensure lower rejects and better casting quality. Key words: investment casting, ceramic shell mold, structure, porosity, reinforcement, stressedly-deformed state, casting.